Berkeley Pumps - Bob Dean Supply, Inc.
Bob Dean Supply, Inc. is a Berkeley Pump distributor and repair facility. We carry a wide range of parts and pumps in stock. BERKELEY Type B frame-mount centrifugal pumps are designed for the user who has a separate power source suitable for driving through couplings or with belts. Ideal for all general purpose applications requiring high performance, moderate initial cost and easy maintenance. 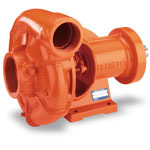 KEY FEATURES: Volute case incorporates precise geometric design for increased hydraulic efficiency; Thick-walled close-grained cast iron to handle the stresses of everyday use; Back pull-out design allows easy removal and service without disturbing piping connections; Enclosed impelled designed and machines to optimize performance and operating efficiences; Discharge may be rotated to any of four positions for piping convenience. BERKELEY'S WARRANTY: 12 months from date of original installation, or, 24 months from date of manufacture.